"The baby spa is meant for newborns, up to the age of nine months, who can float naturally, just like they did in the mother's womb. The aim is to keep them floating. 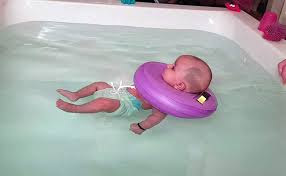 We don't want the babies to stand up, while in the pool," explains Swati Jilla, CEO of Baby Spa. Ms Jilla further explains that "there are a lot many more benefits, including, faster learning, better growth, more attentiveness and awareness, and better immunity for babies. That is what got me to open The Baby Spa." "When babies are are overexcited and stimulated all the time, the information overload may adversely affect their learning skills. This may even lead to them shutting out a lot of the learning. We don't want that to happen. We want them to be interested, attentive, open minded, and able to absorb information without stress, to ensure that the best learning takes place,'' she said.